Peanut butter and banana go great together. With that in mind, I created this banana bread that uses protein-rich peanut butter in place of butter or margarine. Preheat oven 350° F. Grease and flour a 1-pound loaf pan. In a large bowl, beat sugar and peanut butter until fluffy. Beat in eggs on slow speed until blended then add bananas and yogurt. Beat on low speed for 30 seconds. Stir in remaining ingredients until just combined then pour into loaf pan. Bake 55 to 60 minutes until toothpick comes out clean when inserted into the center of the loaf. Cool in pan for 5 minutes and remove to cooling rack. Wrap tightly in wax paper and then in a layer of aluminum foil. Store in the fridge for up to 5 days. Nutritional Stats Per Serving (1 1-inch slice): 247 calories. 8 g protein, 36 g carbohydrates, 9 g fat (2 g saturated), 1 mg cholesterol, 4 g fiber, 222 mg sodium. Make It A Meal: Serve with Turkey Meatballs or Strawberry and Spinach Salad. Why has this never occurred to me? 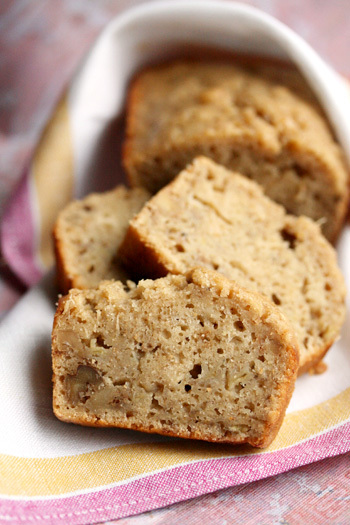 I’m a PB maniac, and I’ve always loved banana bread, but I never put the two together! As soon as I can get to the grocery store for bananas I’m going to try this. Because I’m lactose intolerant, I’ll have to use cultured sour cream instead of yogurt, and I’ll probably reduce the sugar because I don’t like baked goods very sweet. Hopefully the texture won’t be too affected. This bread is wonderful—my kids LOVE it too! I just noticed when I “downloaded” the recipe..it called for all wheat flour instead of a combo. What is “white” whole wheat flour? Thanks for the great question, you’ve just inspired me to write a “healthy ingredients glossary”, so stay tuned! “White” whole wheat is milled from white spring wheat, rather than traditional red wheat, which means it makes lighter-colored, milder-tasting 100% whole wheat baked goods. Use as you would traditional whole wheat flour and King Arthur is my favorite brand. How can I make this gluten free? What products would you suggest? Jules gluten free has a good gluten free recipe you can substitute cup for cup for normal flour in everything or you can try this recipe that you can use in cookies, cakes, muffins, and banana breads, but not real breads. This will substitute cup for cup. I use it in cookies and brownies, cakes, etc. Mix together, put in airtight container in cool, dry place. Use cup for cup. can this be made in a bread maker and if so what would you reccomend needs changing. I’ve never made it in the bread maker, wish I could advise. Does anyone else know? What would you suggest to replace the eggs with in this recipe? My son is allergic to eggs and loves baked goods. I am hoping soy yogurt will work because if his dairy allergy too. Would love to make this since the pb will add some protein. I usually spread peanut butter on my banana bread. Never thought of actually mixing it in. Thanks! I made this tonight. OMG. You are a genius. Thanks!! This sounds delicious. Have you ever used.or could you use almond meal/flour in place of whole white flour? I am making this as we speak, and it smells AMAZING!! My parents are huge fans of banana and peanut butter, so I am more than positive that they will LOVE this! You’re cooking for your parents? How sweet!!! This sounds so moist and delicious. I wonder if I could throw some chocolate chips in there! YUM!! Thanks for the post! If I don’t have yogurt on hand what can I substitute that with? Butter? I know that was a perk to not have but I can’t run to the store and I want to make these bad! I have all ingredients on hand except plain yogurt. Substitute suggestions, please?